In 2012, I represented Florida at the Great American Seafood Cook-Off, a nationally recognized seafood competition held annually in New Orleans. Sixteen chefs from around the country chefs prepare their best dishes, using the domestic seafood indigenous to their state. The event is one of the most exciting and highly respected culinary events countrywide, and is hosted in the city with a world class reputation for food–New Orleans, Louisiana at the Morial Convention Center. Chefs prepared their regional fresh catch, to many to list. To name a few chefs, Louisiana Keith Frenzt prepared black drum and gulf shrimp, Oregon’s Gregory Gourdet prepared Chinook Salmon and butter clams, Alabama’s Chris Hastings prepared an array of gulf shellfish, crustaceans and fish for Bouillabaisse, and I of course prepared red snapper and gulf shrimp. The Great American Seafood Cook-Off was an opportunity to tout our regions seafood, meet creative chefs and dine at some of the cities proudest restaurant seafood supporters. The night before the cook-off, we all visited Drago’s Seafood Restaurant, home of the Original Charbroiled Oyster – buttery Louisiana oysters hot off the flaming charbroiler! Here is my spin-off version for charbroiled oysters, Florida Panhandle-style. 5 slices cured ham (Serrano or prosciutto), half each slice, then quarter each half into 1-inch pieces, for a total of 40 pieces. For the butter: Combine butter, garlic, chives, sherry, jalapeño, paprika, and red pepper flakes in a saucepot. Whisk together over low heat until smooth like yogurt, then remove from the burner. For the breadcrumb and cheese: Mix Parmesan and panko in a small bowl. To assemble: Preheat gas grill or prepare and light a charcoal grill for medium-high heat. Place the loosened oysters in their half-shells on a wire baking rack (see note below). Sprinkle each oyster with a light dusting of the Parmesan and panko mixture to give the sauce some texture to adhere too. Next, apply a generous teaspoon of butter onto each oyster, and then divide the remaining Parmesan mixture between the 36 oysters. Place one piece of the ham on each oyster, then transfer each oyster, one by one, onto the hottest spot on the grill. Let the oysters cook for 3 to 5 minutes. 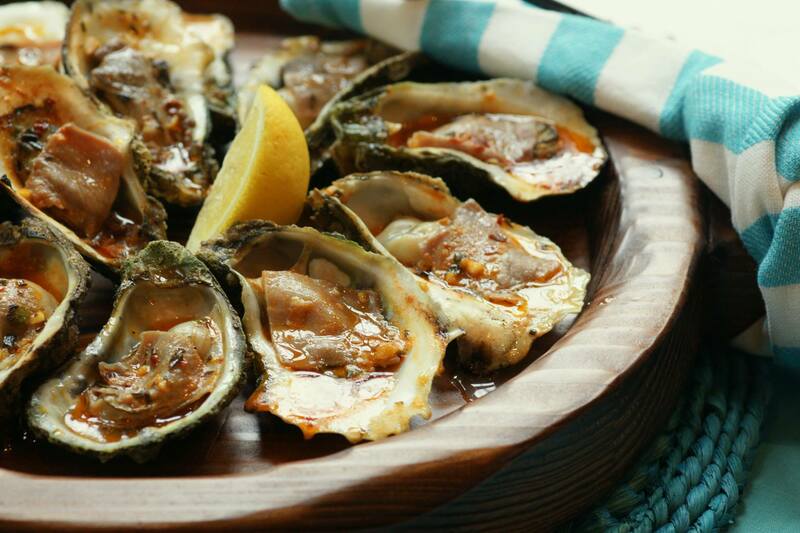 Place a bit of additional sauce over the oysters as they flame and brown a bit on the edges. Let them continue to cook in their own juices for a few minutes, just until the edges curl and the butter is bubbly. Remove from grill. Squeeze lemon wedges over the oysters just before serving. Although the amount of butter may seem excessive, much of it will end up in flames due to the shallow-cupped shape of the oyster. The butter provides a quick cook and intense char flavor acquired by the open-fire grilling process. Handling the oysters one by one over an open fire can be difficult, so I suggest using a standard baking wire cooling rack. That way, you can move the oyster-loaded rack with one swift move using tongs and a kitchen towel and transfer the rack directly to the grill. A spray bottle is good for taming the flame if it gets too high. Chef Irv Miller has been working along the Florida Panhandle and writing about the foods of the Gulf Coast for three decades. He has received regional acclaim for his Northwest Florida Cooking during the Florida Cuisine movement, and in 1999, along with his partners, opened Jackson’s Steakhouse in Pensacola, where he is executive chef. Miller wrote the weekly food column for Pensacola’s Independent News for two years as well as hosted the PBS show Flavors of the Coast. He is a contributor to the “Chef’s Corner” column in the Pensacola News Journal, Jackson’s Steakhouse monthly newsletter, and the Viva Florida 500 website, and has appeared on Emeril’s Florida television episode “Viva Florida”. 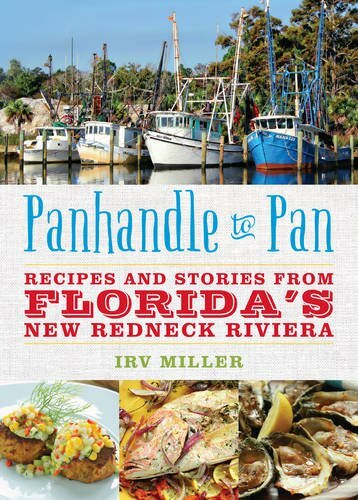 Miller’s short essay and recipes are included in The Lodge Cast Iron Cookbook 2014, and he was selected to represent the state of Florida in the Great American Seafood Cook-Off 2012. He has been a five-time performing chef for the James Beard Foundation, and has served three years as a founding member of the Pensacola Celebrity Chefs. Miller’s longtime commitment has been to the Florida Panhandle and Southern-inspired foods. He lives in Pensacola, Florida.